I've finally made a decision about the labels to attach to my work, and here they are! 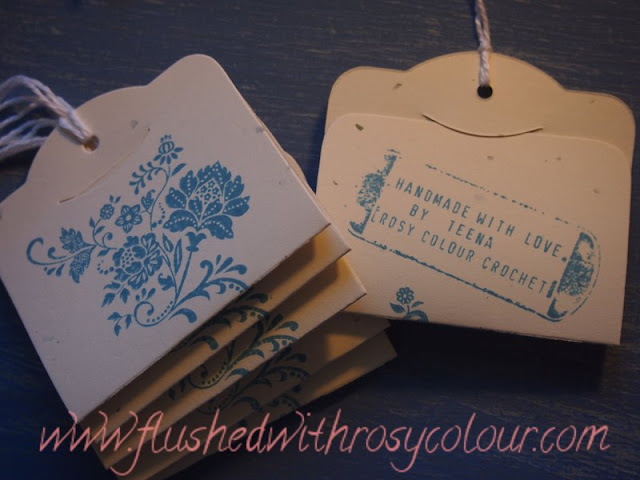 I was considering using tags ironed onto ribbon using my DYMO labeller and iron-on tape. I'm still not sure about that, I may yet do it as well. But the very least I need is a tag with the washing instructions, which is very important! Thankyou to my mum who gave me these fantastic flower stamps and ink, I think they're really pretty and will do the job very nicely. I also dug out an old stamp I've hung onto from my old life, a good thing too as it's been very useful over the years. It's quite fiddly to arrange the letters, and even more so when putting the tiny letters back in the case. But its not something I have to do very often. I just leave these letters in the stamp for now! I was going to attach ribbon to these, but I've since decided that some nice clean white crochet cotton will do the job better.